Three models of Apple iPhone 8 and iPhone X successor are leaked on the internet. Apple is preparing for the launch of three new upcoming iPhone this year such as iPhone XS, iPhone XS Plus, and iPhone 2018 edition. We already discussed it in our a few weeks earlier post that Apple is trying to get settled with Samsung for OLED display panel cost. 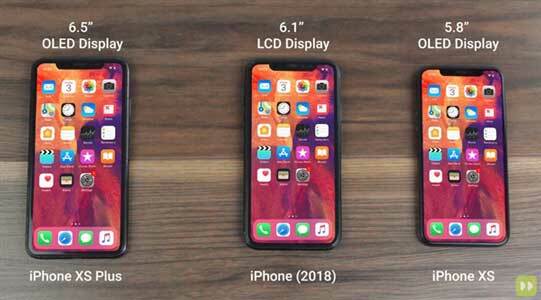 Meanwhile, the company is collaborated with LG to provide affordable display panels for their upcoming three new iPhone models in this year. By which, almost over 2 millions of OLED screens already supplied to apple for the 6.5-inch iPhone (iPhone XS Plus) a few months ago reportedly. There are some leaks and renders about the display, design, and specifications of these three variants. 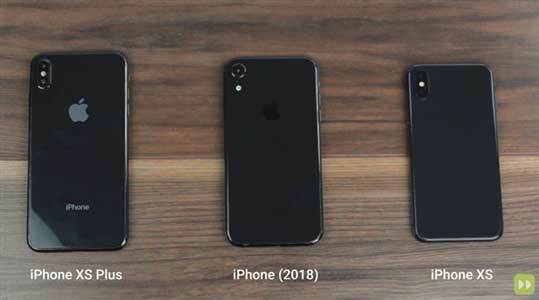 But recently, a video leaked online which shows the dummy units of the upcoming iPhone devices in 2018. Apple will release the successor device of the iPhone 8 as the iPhone 2018 edition and the iPhone XS and iPhone XS Plus will be the successor of the iPhone X variant. Whereas, it looks like Apple don’t want to release the 9 version of iPhone this year and in future also. The iPhone 2018 edition could be the entry-level smartphone by Apple like iPhone 8 and 8 Plus reportedly. This device could come with a 6.1-inch LCD display and it should be priced under at $500-$700 approximately. The iPhone XS handset could come with a 5.8-inch OLED display and the device could be priced at around $1,000 (approx). On the other side, the higher model of 2018 generation Apple iPhone XS Plus will come with a massive 6.5-inch OLED display and this could be priced higher ($1,000+ approx) than current iPhone X model. In terms of the rest of the specifications and features, the Apple iPhone 2018 edition could be featured with a single rear and front camera like iPhone 8 model. Whereas, rest of the two smartphone variants will come with a dual rear camera setup. However, the iPhone XS Plus could come with a dual front camera setup as well, reportedly but there is no confirmation about that. All of the three mobile phones will feature the same notch display, swipe gesture control, 3D Facial Recognition Unlock support and more. This time the company will bring the Apple A12 chipset under the hood to all three iPhone variants and the new upcoming iPad 2018 generation will be powered by Apple A12X processor with the powerful 7nm process. In terms of the cheaper display panels provided by LG will definitely reduce the selling cost price of an entry-level model at least. All the three models will be available in different RAM and storage variants. The look and feel with an aluminum frame, glass back, and camera setup will be almost similar to the iPhone X model. As per reports, the base model could be packed with a smaller battery, lesser RAM, and may not be featured with 3D Touch. However, it is rumored that Apple is trying to add dual-SIM support to their future iPhones, but not confirmed yet. Apple has already removed the 3.5mm audio jack and using lightning port instead of USB Type-C port. If the company try to fix these issues then it will gain more user credibility in terms of price point. Apple will announce these three iPhone models with new iPad and new Apple ‘A’ series processor in September this year. Within a few weeks, there will a lot of rumors and leaks come out but we have to wait for the official launch event. As per reports, LG will supply more display panels including LCD screen for iPhone 2018 edition in this month as well. Apple is now worth $1 Trillion last week and is the first Trillion-Dollar U.S. Company. The company shares increased up to 31% over the last year.